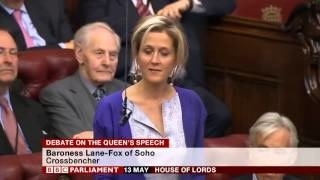 I may look calm but i was flapping inside when I made my maiden speech in the House of Lords yesterday. Here is the text if you would like to hear what I tried to champion for digital britain. Please use any of it if it is ever helpful! “My noble lords, I may not be the first lane-fox to make a maiden speech but I think I may be the only baroness to have survived a virtual and a real world crash. In 2000, the company I co-founded, lastminute.com navigated the ups and downs of the dot com era but survived and thrived as I was also lucky to do after being flung from a car in 2004. I had heard of the friendliness of this house but I have been overwhelmed by the help and support offered to me from the moment I walked in – from the security guards to the attendants, administrative and catering staff. I would also like to thank my two supporters – lord chadlington and baroness king who were so jolly on my introduction day that all nerves were banished. In 1981 my great aunt, felicity lane fox made her maiden speech highlighting the importance of rights for the disabled so it is a particular privilege for me to be able to stand here with her great example before me. I would however like to reassure the noble lords who knew her that I do not intend to career down any corridors towards my detractors as she was given to doing in her recently electrified wheelchair – a very effective weapon of persuasion. When we first began to build lastminute.com in 1998 we spent most of our time on a mission to convince customers, investors and suppliers that the internet would not blow up and was going to be a positive force in the economy. It was therefore a surprise to me that over ten years later, when I was asked to become uk digital champion I was still spending most of my time encouraging two successive governments and many millions of people that the internet has much to offer. The UK has built strong digital foundations. The country has moved on considerably from the era of the website we created that was held together with string. The internet economy accounts for over 8% of our GDP – greater than any other G20 country. We have competitively priced access and good digital infrastructure in many parts of the country. The uk has the highest percentage of ecommerce in its retail sector in the world and one study suggests the internet now accounts for around a quarter of our economic growth. I would like to argue that we should go further. I see access to and usage of the Internet as a right all citizens should be able to enjoy. Shockingly, 16 million people in the UK lack the basic skills to be able to gain all the benefits of being online. Why does this matter? Partly because we know the majority of that number come from the most disadvantaged communities and we also know that people who are online are 40% more likely to be able to get work and that they attain 25% better grades in education. Being online saves you money too – even the lowest income households can save up to £170 a year. we also know that internet usage can help reduce feelings of isolation and loneliness – important when you consider 1.5m of the unskilled are living alone and have no visitors in a whole week. I am lucky enough to have seen again and again the transformative effect that learning how to use the internet can have. I think often of a young man I met in leeds who was homeless and addicted to drugs but told me the internet had saved his life. I was amazed – was he sure? The internet? But yes, at a drop in centre he had visited when he had nowhere else to go, he had learnt how to mix music online and was now making and selling it to people all over the world. He was also mentoring and teaching others. he was a budding entrepreneur and he was helping his community. is a powerful tool to help people who face the biggest challenges – whatever their age or location. We must not create a two tier society but instead should aspire to a universality of digital skills that will help the UK to grow and prosper at a national level as well as at an individual one. I believe that we will never unleash the potential of all citizens without focusing on all aspects of digital growth – both skills and infrastructure. who knows what the homegrown innovations of the future might be? My noble lords, solving this challenge is possible. We know that one of the most powerful ways of helping people to understand technology is through peer to peer support. Imagine my delight when I realized I was about to increase that pool of peer support in my own life so dramatically! The internet has enabled me to start two businesses and two charities, survive years in hospital and enjoy a richer cultural life than would ever have been possible before. I am honoured to be in this house for many reasons and I hope that from here I can continue to encourage a bold digital ambition for the united kingdom. I couldn’t agree more with the sentiments highlighted in your maiden speech in the lords and am thankful hat the house now has such an eminent champion for this digital age. I see the advent and the utilisation of the internet to its fullest to be of paramount importance to everything from the economy to education to the environment and would dearly like to talk to you and discuss a matter of the utmost importance in regards to how social media in particular can be used to much greater affect to assist British business at this current financially challenging time. I have followed you from two of my twitter accounts (canary wharf & oxford street) and have left messages for you at the Lords and am seeking to work with go-on.co.uk to help bridge the digital divide emerging in society. I would be very grateful if you would either email me or follow be back on Twitter so that I might outline to you briefly how I think massive inroads can be made to assist regions in the UK and businesses worldwide. You are one of my greatest heroes, because you were able to overcome an accident, and having suffered one myself is something one can never predict in our lives. Unfortunately in my case since the RTA I never received any form of adequate medical help. Instead for more than five years I have lived under severe constant pain and daily tears as a result of being abandoned. That accident would send my life into the deepest misery I ever imagine so negative, and an unpleasant litigation process. I had passed triple travesty of justice, confronted the statute limitation period. I had to fill my form as no one was available to help. And as I found solicitors, still more drawbacks, as few weeks ago, for three hours my solicitors would put so much conversation on me to sign a settlement which I did not want to do it during the large discussion, but in the end perhaps upon so much psychological pressure and threat that if I don’t do it, my case would jeopardize, I had to sign a paper that I did not even read, in an almost dark scenario and this meant an end of the case, Perhaps trying to grab something out of nothing, but later at home I realize that was not sensible decision but I had too much pressure on me, and vulnerable lost control. A couple days later I realized certain issues, I requested Cancellation based on those two points of having signed under pressure, and believe of breach by the defendants, but the solicitors said is a binding agreement, and that’s the end of it. I believe I had reasonable justifications to cancel but they wouldn’t. As one of our leaders of technology, I humbly plead for your support as/when over the next days, a week or two, I will have to stand somewhere near the parliament or court to demand access to fair justice, even if this will mean a day and night/ sacrifice. without food or shelter. because I truly believe my case had a real good value whereby especially the government would have been the biggest beneficiary. If I would be allow to reopen my opportunity to reveal the truth and have success, I will be willing to give any compensation to the government, in turn all I would like is access to Justice that would allow me to restore my integrity. I have fought hurdle after hurdle, all to be spoiled by pressure of solicitors that was not only strong words, but was very disturbing, it really hurts, I have no sense of life, currently no social life, no family. not even next of keen as a result of the accident that alienated anyone close. Five years housebound, trying to recover without any help. I will have to stand until there would be nothing more left, but I will make sure the message is clear. The poorest, humble and homeless in society have rights, In a rapid changing world the secrets of the past are over, as the Internet keeps eroding asymmetries of the past. This is my first note of a campaign that starts tonight, for the first time I will join twitter and my first tweets would be to Beth Novek, Tim Kelsey, Tom Steinberg, and leaders of technology government policy, because I believe if people like you could help to pursue this case currently seen as sealed, we can all make real changes in the service of society. This is my last journey, the journey for justice, the journey that will demand courage, determination and willingness to stand and endure until nothing but nothing is left, If we cannot achieve today, tomorrow people should remember that some people despite the lack of education, degree, or social status still fought with their lives because they were oppressed.